There will be some who will want the flush design offered by the Paperwhite, along with the waterproofing and the sharper display, or perhaps the physical buttons and larger display of the Kindle Oasis. For many though, the standard Kindle (2019) will be the Kindle to choose. It delivers excellent value, coupled a plethora of features and a fantastic reading experience. Bravo, Amazon, bravo. The Amazon Kindle has come along way since the ebook reader first launched in 2007. There are several models available for those happy to ditch the look, feel and smell of a good old fashioned book, from the top-of-the-range Amazon Kindle Oasis to the basic Kindle, with the Kindle Paperwhite slotting in-between. For 2019 the latest 'basic Kindle' is an all-new replacement of its 2016 predecessor. But it's far from basic, introducing an illuminated display (like the Kindle Paperwhite) but for a more affordable price point. Is it the Amazon Kindle to buy? The latest Kindle looks very similar in design to its three-year-old predecessor; at first glance you would be hard pushed to tell the difference between the two. The new Kindle is fractionally slimmer and narrower, but what it loses off its waistline it gains in weight (at 15g heavier than before). That weight isn't noticeable when in use though. The new Kindle remains a fantastically slim and lightweight device that is a pleasure to hold and use one-handed. It doesn't have the same tactile, rubberised rear as the Kindle Paperwhite, opting for a plastic finish with less grip instead, but the overall result is still a great one. Like its predecessor, the 2019 Kindle has a raised bezel surrounding the display, so the body doesn't sit flush to the E Ink screen as it does on the latest Kindle Paperwhite. This design detail is the main reason the new Kindle looks so similar to the older model and some might criticise its design for not moving forward enough. The raised bezel means dirt and sand can get trapped between the body and the screen, and when you turn a page (which is actioned through touch), you might find the bezel gets in the way. Ultimately though, the standard Kindle's design works for its purpose and while it has its shortcomings, the raised bezel does offer some protection for the E Ink screen that you no longer get on the Paperwhite. Yes, the flush finish of the Paperwhite is lovely and, yes, the physical buttons on the Kindle Oasis are great. Plus the waterproofing on both of these more expensive devices is a nice-to-have feature for by-the-pool reading too, but the basic Kindle does its job and it does it very well. If you want the extras then it's just a case of paying a little more, really. The 2019 Kindle might look similar to its predecessor on the surface but it offers one key difference: an illuminated display. It's this feature that makes the new Kindle so much more exciting than the last model. The illuminated display allows you to read the monochrome E Ink display in the dark or bright sunshine, but most importantly, it doesn't use LCD or OLED technology like many tablets or phones so it won't drain the battery. Instead, the new Kindle uses LEDs to light up just the surface. There are four LEDs lighting up the Kindle's display, which is one less than the Kindle Paperwhite and a third of the amount in the Kindle Oasis - the theory being the higher-end models will deliver a more precise and uniform illumination. However, the four LEDs in the Kindle offer an even distribution across the display, while the manual adjustment is nice and simple to use - it's only the Kindle Oasis that has automatic lighting adjustment to adapt for various ambient lighting conditions. You won't need the LED illumination during the day, unless in very bright sunshine, so it's best to turn it off to conserve battery life. In terms of resolution, the Kindle has a pixel density of 167ppi across the 6-inch diagonal E Ink display. While the display is the same phsycail size as the Kindle Paperwhite, it's approaching half the resolution - the Paperwhite, at 300ppi, is far sharper - but text still appears nice and crisp. Unless the two devices were side-by-side, you'd be unlikely to notice. The Kindle's battery life depends on the number of page turns, how frequently you access information online or download books, as well as the display brightness. Use it continuously on holiday at the beach and you'll probably need to charge it within a week, based on our previous experiences with Kindle devices, but for casual night-time reading you'll get weeks and weeks of use on a single charge. Amazon quotes six weeks (we haven't had one for long enough to test it that far!). Unfortunately, like the Kindle Paperwhite, the new Kindle opts for Micro-USB over USB Type-C - the latter being the faster and more common standard among new phones - and there is no fast-charging support. That means you'll need to keep it on charge for a couple of hours to top the battery up - it can't be done in a matter of minutes. The new Kindle brings many of the great features Amazon has been adding to its e-readers over the years, but it brings a couple of new ones too, as is generally the case with every new Kindle. It's worth mentioning these new features will come to other Kindles, so they aren't an exclusive here. First of the new features is that completed books are automatically marked as read. When you finish a book, it will be marked as read in your library, which will be synced across your reading devices, from your Kindle to the Kindle app on your iOS or Android device. You can also filter to see the books you've read and the ones you haven't with a few taps, making navigation that little bit easier. The second feature is for better recommendations. Amazon updated the Kindle Home experience last year, making it easier to find your next read, but the new feature offers more recommendations based on your reading history. New and trending titles in Kindle Unlimited and the Kindle Store will also be included. 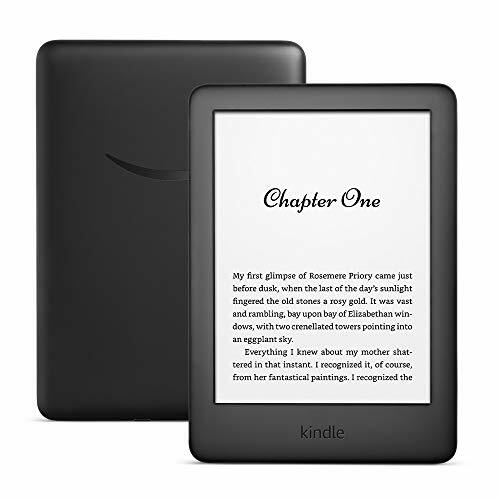 The standard Kindle also offers access to Kindle's other features - including Goodreads for access to over 50 million members and 47 million book reviews, and X-Ray for exploring the "Bones of the Book" such as all the passages that refer to relevant ideas, fictional characters, historical figures or places. There's also Bluetooth on board and compatibility with Audible, allowing you to connect Bluetooth headphones to listen to an Audible book and switch seamlessly between listening and reading. The Whispersync feature, meanwhile, saves and synchronises your last read page, along with any bookmarks and annotations across all your Kindle devices and the app - meaning you can pick up where you left off. Kindles are great for their ability to not only store plenty of books, but access lots of new reading material through the Kindle Store and Kindle Unlimited. The Kindle Store could still do with a refresh - it can be a little complicated to navigate - but you do get top picks and recommendations based on what you've read or your Wishlist, and there are various tabs for Prime Reading or ebooks with Audible, for example. Amazon offers a range of different ways to buy content. you can buy it direct, or you can get access to various reading subscriptions. There are free books available with Amazon Prime (if you're a subscriber), too, and there's Kindle Unlimited for wider access. From 10 April 2019 users will (for a limited time) be able to sign up for three months of Kindle Unlimited for free, offering access to over a million titles and a wide range of genres. Following the trial period, Kindle Unlimited costs £7.99, but it's a great service to try for a couple of months to see if you're enough of a book worm to make the most of it. Overall, the Kindle Store experience could certainly be better, but this applies to all Kindles, not just the new one. Besides, the content is all there, it's just not organised in the most efficient way - which is a typical trait of Amazon. The 2019 Amazon Kindle is a fantastic device. Its design may only offer minor updates to its predecessor on the surface, but the addition of a front illuminating light is absolutely a reason to upgrade from the 2016 model. Almost all of the late 2018 Kindle Paperwhite's features are on board this new standard Kindle for a cut of the price, making the 2019 model the most obvious choice for many who want to give up a good old fashioned paperback. There will be some who will want the flush design, waterproofing and sharper display offered by the Paperwhite, or perhaps the physical buttons and larger display of the Kindle Oasis. For many this standard model that will be the Kindle to choose. It delivers excellent value, a plethora of features and a fantastic reading experience. Bravo, Amazon. The Paperwhite offers all the same features as the 2019 Kindle, but it delivers a sharper display, more streamlined design and waterproofing. It's more expensive, but it's a great option for those who like to read in the bath. The Amazon Kindle Oasis is the top-of-the-range Kindle. It offers a slightly larger display than the Kindle and Paperwhite, along with an adaptive illuminated display. Like the Paperwhite, it is also waterproof.